I’ve begun to harvest my garden with something other than weeds. Cucumbers, peppers, zucchini and a few grape tomatoes graced my table and freezer. 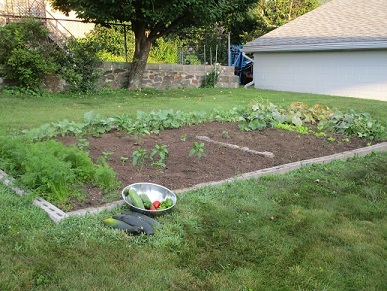 Soon I’ll have carrots, more tomatoes, lettuce and kale, too. Conditions for growing this year have not yielded what they normally do. 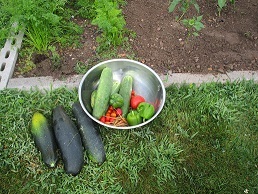 Too much rain early, a later planting and a hungry rabbit family added to my more meager outcomes this year. Nurturing conditions play a huge role not only with what a garden will produce but also what we achieve. Like drought and predators can decrease a harvest, financial or legal worries, doubts and health issues can weigh down our enthusiasm and motivation. On the contrary, conditions that encourage our hopes and desires — such as fun, friendships, emotional support, love and acceptance — can boost our motivation. They can inspire us to pursue our dreams. This entry was posted in Inspiration, Nature, Passion, Spiritual Living and tagged inspired living, Nature, Spiritual living. Bookmark the permalink. 1 Response to What Conditions Nurture You? I nurture growth by putting my roots into logical thinking, soaking up nature’s gifts, and focusing on the sunny side of life.